Once every two years, Clalit Health Services selects outstanding Units and Departments from among its chain of 14 hospitals to promote medical standards and professional excellence. 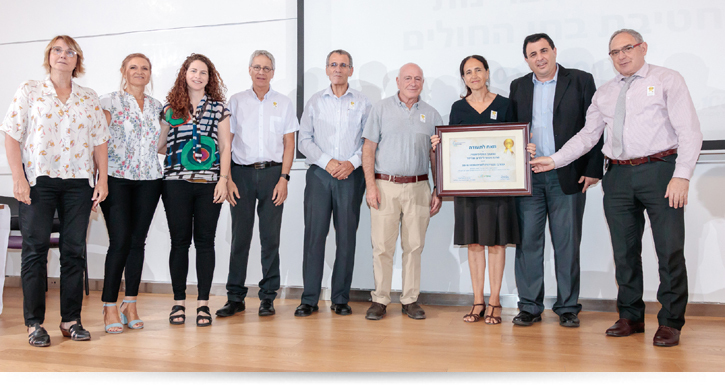 Among the 19 departments and units recently selected as centers of excellence was Schneider’s Department of Psychological Medicine due to achievements in treatment, research, technology and medical care. The team in the department, headed by Prof. Silvana Fennig, treats children and adolescents from all over the country, who suffer from complex problems involving functional and emotional difficulties. Their worldview is based upon the humanistic principle, complete cooperation with the child and his family, and full transparency concerning the therapeutic program. The department aims to provide a broad multidisciplinary medical response that integrates body and soul as one entity, honors the dignity of the individual, maintains quality and safety of care, and full responsibility for the child and his family. Several targeted clinics for specific mental health disorders in children and adolescents comprise the department, among them Depression and Suicide; Anxiety; Tourette Syndrome and Tics; Post Trauma; Selective Violence; Developmental Disorders with emotional morbidity; Biofeedback and Hypnosis; Parental Authority; Learning Disabilities; Family Therapy; multidisciplinary ADD; Body-Soul Integration; pre-Surgery Bariatric for Chronic Obesity; and General Psychiatry. In addition, the Crisis Intervention Inpatient Unit treats a wide range of psychiatric disorders and body-soul difficulties. Treatment for Eating Disorders includes a clinic, day care and hospitalization, allowing continuity of care all in one location. Departmental staff also provides mental health counseling services to other departments, clinics and the ER.